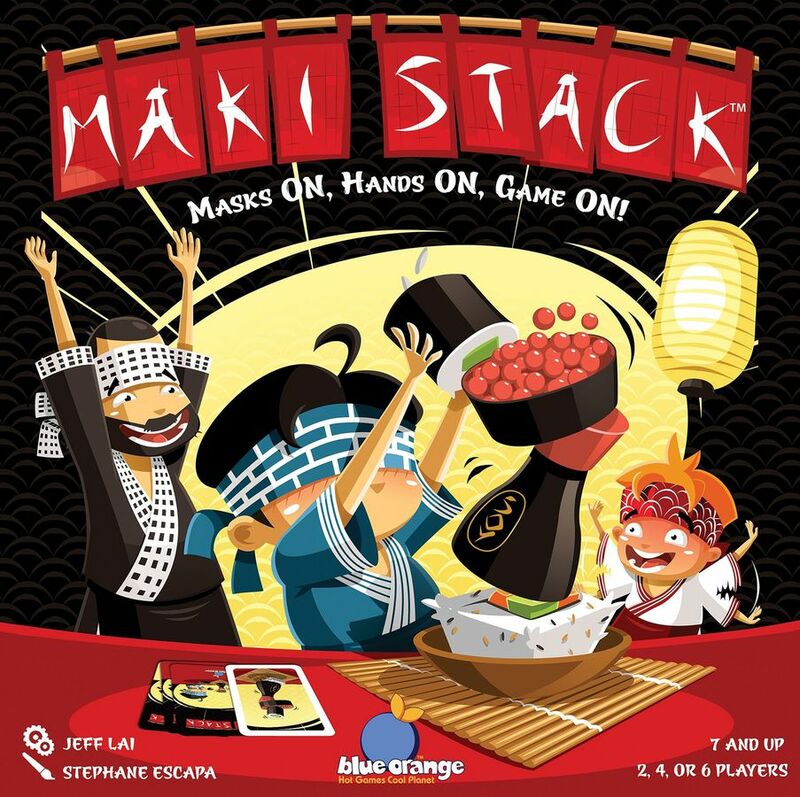 Maki Stack is a game by Jeff Lai, published by Blue Orange Games. It is for 2, 4 or 6 players. 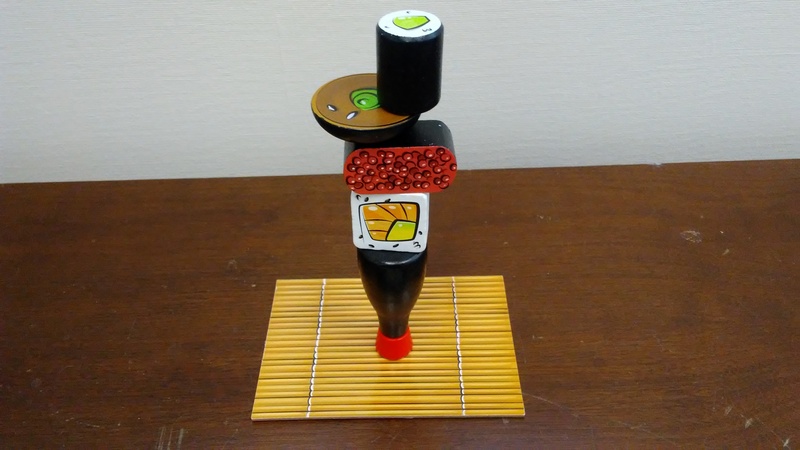 In this game, players will be teaming up as they race to stack up plates of sushi and soy sauce. In some cases they’ll have to do it blindfolded, while other times they’ll be using their fingers as chopsticks. In the end, the team that can win 6 Challenges first will be declared the winners. To begin, players should be divided into 2 even teams. Each team is given a Sushi Mat, Mask, and a Sushi set, consisting of a Cucumber Roll, a California Roll, a Fish Roe Roll, a Soy Sauce bottle and a Plate. The Challenge cards are shuffled together and placed face down in the middle of the play area. The rules for both modes of play are explained so that both teams understand them. Once everyone is ready, play now begins. The game is played over a series of rounds. The way each round is played is determined by the Challenge card. If the card shows Mask mode with a red card, the team must pick a player to wear the mask. This player will be the one to stack up the objects, while their teammates direct them by describing the stack shown on the card. 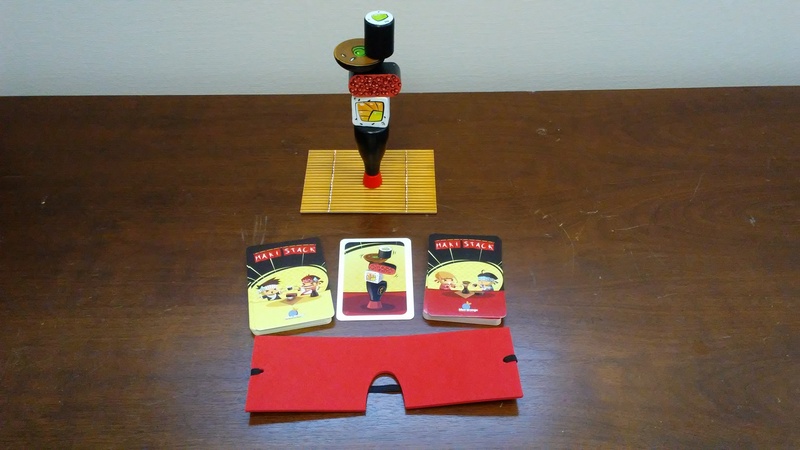 If the card shows Chopstick mode with a yellow card, the teammates must work together to stack up the objects on the Challenge card, but may only use one finger. It should be noted that a player that is describing the stack can not touch any of the objects or show their teammates the Challenge card. Once the game mode has been determined, the Challenge card is flipped over or picked up to reveal the stack. Both teams will now race to complete the challenge, exactly like it’s shown on the Challenge card by stacking up the various objects to match the picture on the card. If the stack falls, the players start over. The first team to complete the challenge wins the Challenge card. The game continues with teams stacking up the different objects as they try to complete each Challenge card. The first team to collect 6 Challenge cards wins. For games with only 2 players, the rules are a bit different. Setup is all the same, except that the masks are not used for 2 player games. Another difference is that all of the challenges are played in Chopstick mode, regardless of the card color. In this mode, the players must use a finger from each hand to stack up the objects. The rest of the rules remain the same. This game comes with some really great looking pieces. First off there are all the large wooden pieces. There are 6 sushi pieces, 2 of each kind. There are also 2 bottles of soy sauce and 2 plates. Each of these pieces looks like just what it it’s supposed to. The pieces are fully painted and look very nice. They’re large enough that even younger players should be able to manipulate the pieces fairly easily. I really like how nice and fun the pieces are. The game also includes to large cardboard mats. These have a glossy finish and look like bamboo. There are 2 blindfolds that appear to be foam rubber with an elastic band attached to them. Surprisingly they work well. I honestly didn’t think that they would work but they are pretty good at making it hard to see. The final pieces are the Challenge cards. These are a bit larger than normal playing cards. On one side there’s a picture of the pieces in a particular arrangement that players will need to arrange them into. On the back side the card shows either the red Mask mode or the yellow Chopstick mode. The cards are quite nice and they’re fairly easy to understand as well. I like how nice everything looks on the table. It has a very thematic look to it. Overall the components are good quality and are well made. I’m quite pleased with the finished product. The rulebook is a double sided piece of paper. It’s fairly small too. There are only 2 pictures on the page, one of each of the different card types. There are no examples of gameplay included, but there’s not really much need for any. The rules are easy to understand and are explained really well. There are rules for 2 players which are a bit different than the regular rules. The rules also include some different variants that make things a bit more difficult. Overall, everything is very straight forward and easy to follow. There’s nothing difficult to understand. Considering that the rules are so simple, there’s no need for anything bigger than the single sheet of rules. However I do wish that this had been placed on a card or something a bit sturdier, as the sheet tends to curl up around the edges. For the most part, it does the job it’s intended to do, even with the small issue. I’ll be honest, I’m not a big fan of dexterity based games. Games like Jenga have never interested me. When my friends would stack up their dice as we played D&D, I didn’t find any thrill in doing it myself. My daughter, however, is a different story. There’s something about stacking things and trying not to let them fall that intrigues her. The child has a copy of Jenga at both of her grandparent’s houses as well as having a copy at home. She will play the game by herself if no one else wants to play, stacking up pieces as she tries to keep them from falling. It’s like she’s trying to see just how close she can get to making the tower fall before it actually happens. It’s no wonder then that she likes this game too. The large clunky pieces with their bright colors and fun shapes really caught her eye, as well as mine. I’ll admit, the pieces were what caught my attention to begin with. I thought that even with my aversion to dexterity games, this looked like it could be fun anyway. It seems that I was right. I have to say that I do enjoy stacking up the pieces, maybe it’s due to the bright colors and shapes. I couldn’t honestly say. My daughter and I have played this one with just us, however I’ve simplified things a bit to handicap myself just a bit and give her an advantage. I play the normal rules of Chopstick mode, while she simply tries to stack things up accurately. It seems to work out pretty well for us, as sometimes she misses the simple details of how a particular piece will be turned. This gives her a few extra seconds to think as I’m trying to get my pieces stacked with just 2 fingers. As a family game, it’s rather fun and silly. The kids enjoy teaming up against each other, using my wife and myself as their teammates. Needless to say, the boys vs the girls tends to be a regular match up in more than just this game. It’s nice to hear the laughter as we race to stack up the pieces. It’s fun even when you just barely lose. This is a nice family friendly style game. It’s one that can be played with all ages. Fans of dexterity based games like Jenga should enjoy this one. This is one that I would recommend. 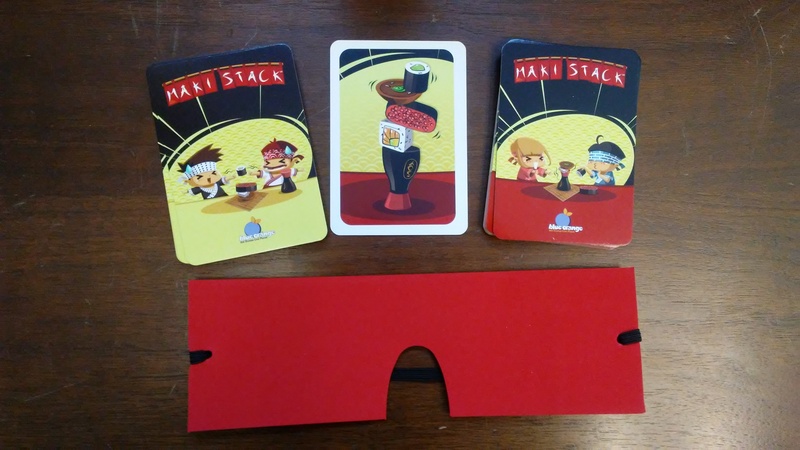 Maki Stack is a game full of sushi stacking fun for the whole family. The game doesn’t take very long at all. Most game sessions last around 15 minutes. The components are all really good quality. The wooden pieces are all big and brightly colored and we like them a lot. The rulebook is a bit small and is only a double sided sheet of paper. I really would have preferred something a little more durable, as the paper tends to roll up on the sides. The game itself if a fun family friendly style game that can be played with all ages. There are plenty of ways to play the game to make it harder or easier. There are even rules for games with just 2 players. My daughter really enjoys stacking up all the pieces and she likes watching my stack fall even more. Fans of dexterity based games like Jenga should enjoy this one. For me, it’s an actual dexterity game that I don’t mind playing. That’s a win in itself. In any event, this is one that I would recommend. Each order is sure to make you smile. So start stacking, cause your order’s up! This entry was posted in Reviews and tagged blue, blue orange games, board, board games, card, card games, games, jeff, jeff lai, lai, maki, maki stack, orange, stack. Bookmark the permalink.